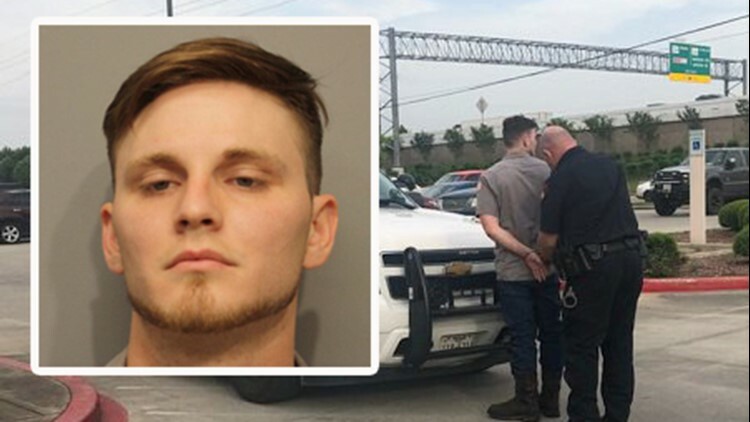 HARRIS COUNTY, Texas — A Houston-area man was arrested after deputy constables say he was avoiding paying tolls by using a device that flips and conceals his license plate. Preston Cody Talbot is charged with possession of a "license plate flipper," according to The Harris County Precinct 4 Constable’s Office. The driver is said to owe more than $5,400 in tolls. A deputy pulled Talbot over when they said he failed to pay a toll in the 8000 block of the North Sam Houston Parkway West. During the traffic stop, deputies found the license plate flipper on the rear of the vehicle. "He would activate this device, putting a flipper down in front of his license plate, so the cameras at toll plazas couldn’t read his plate,” said Constable Mark Herman. “Obviously, this was a stupid mistake,” Becki Morgan, his mother, told KHOU 11 News. The electronic device allows a driver to flip between two license plates at a touch of a button in a 180-degree fashion. That means a driver can flash a different plate when traveling through a toll to avoid getting photographed and penalized for not paying. Flippers are for sale on various websites for $200 to $300, but they’re illegal to possess or use in Texas. That’s something Morgan believes her son won’t be doing again. Talbot was charged with a misdemeanor and already bonded out. He could face additional charges related to all of those unpaid toll fees.